BROOKLYN HEIGHTS — The Brooklyn Borough Board voted Tuesday to approve a controversial plan to sell the Brooklyn Heights Library. In a 13-to-1 vote with one abstention, the board approved the $52 million sale of the branch at 280 Cadman Plaza West to developer Hudson Companies in partnership with Marvel Architects, which will be designing the building. The board delayed voting on the sale earlier this month so it could have more time to review the plan in detail, according to Borough President Eric Adams. As part of the plan, the new building will become a 36-story luxury condo that will still have space for a library, a STEM (Science, Technology, Engineering and Math) education center, retail and parking. The Brooklyn Public Library will receive $52 million from the sale, about $40 million of which will fund improvements at other branches, according to David Woloch, the library’s executive vice president for external affairs. The rest of the money will go towards rebuilding the Brooklyn Heights branch, which Woloch says currently needs $9 million for improvements that include a new air conditioning system, faulty elevators, poor layout and lack of technology. 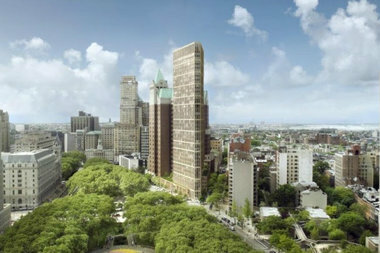 “It is a mid-20th century library and the Brooklyn Heights community deserves a 21st century one,” Woloch said. The library could also get a cut of condo sales as part of the developer’s deal with the city. The Board’s vote finalized the plan, which was approved by the City Council in December after Councilman Stephen Levin threw his support behind it. “I believe that the proposal that we eventually approved is a better proposal than was originally proposed and a better proposal than the status quo,” Levin said Tuesday. The new Brooklyn Heights branch will be 26,620 square feet, which is larger than what the developer had originally proposed but smaller than the existing branch. The deal also allocates 9,000 square feet for the city-run STEM education lab within the high rise, plus a new 5,000 square foot library in the DUMBO/Vinegar Hill area. The developer will open an interim library at Our Lady of Lebanon Church, at 113 Remsen St., during construction of the new tower to prevent interruption in services to the community. As part of the deal, Hudson has also pledged to build 114 below-market-rate rental housing in Clinton Hill. The controversial sale has enraged several residents and library advocates who claim the library lied about an unused $100 million from previous city budgets to move along the deal. Library officials denied the accusation, saying the money has already been allocated and that there are still $300 million worth of unfunded projects in the pipeline.